If you haven’t noticed, I just installed a “like” button since Tiramisue commented on it. So… Yeah, there it is! Pretty easy to install. Meanwhile, I always check my spam folder and this is pretty disappointing. 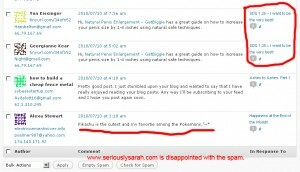 The spammer there is talking about Pikachu (albeit with typoes) but alas she is in the wrong post. She should have talked about Pikachu on the other post here where I did go to a Pokemon event. Silly robot spammers not spamming in the correct post when they had the chance! And you changed your layout too! Hahaha I changed it back when I upgraded my wordpress and went “ARRGH, it killed my layout!”.